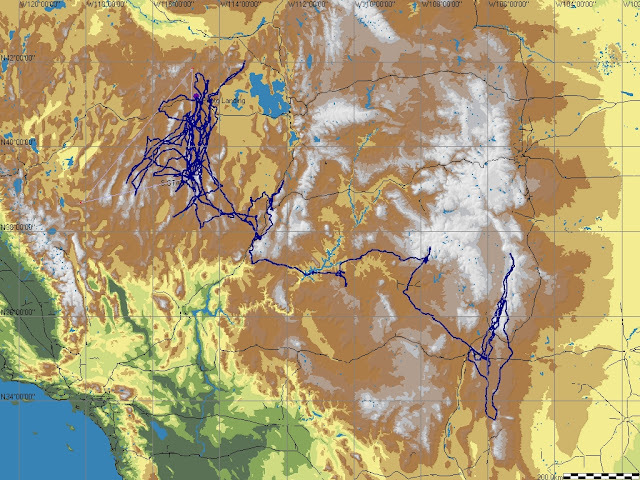 Flight traces from one month soaring safari spanning 6 states (Nevada, Utah, New Mexico, Arizona, Colorado, Idaho) and places such as Zion Canyon, Lake Powell, Wheeler Peak, Monument Valley, Durango, Santa Fe, Sandia Peak. Total distance flown: 6200 miles (10,000km). Total flying time: 96 hours in 14 flights (averaging 442 miles and 7 hours per flight).